Dear Readers, As you know SSC has declared the result of SSC CGL 2016 Exam. 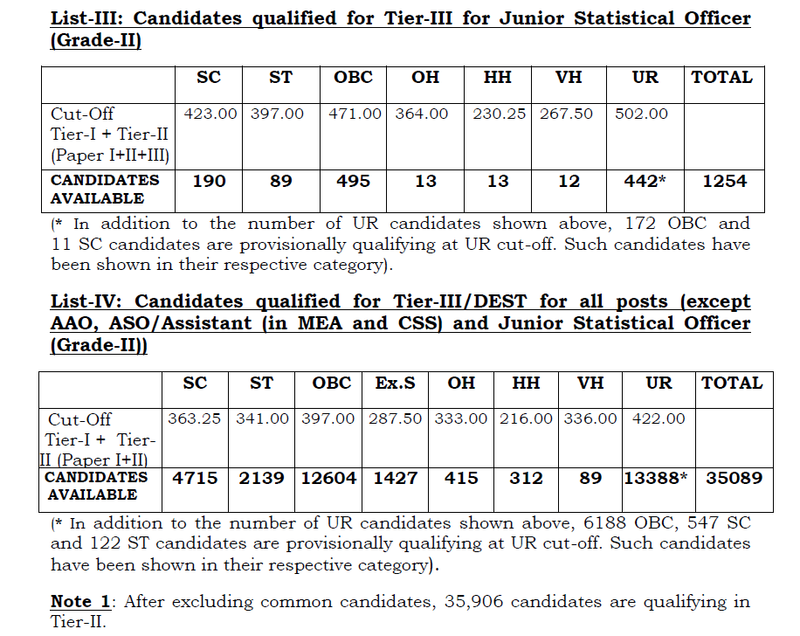 We are presenting cutoff marks of Tier I and Tier-II and number of candidates qualify for Tier-III exam. 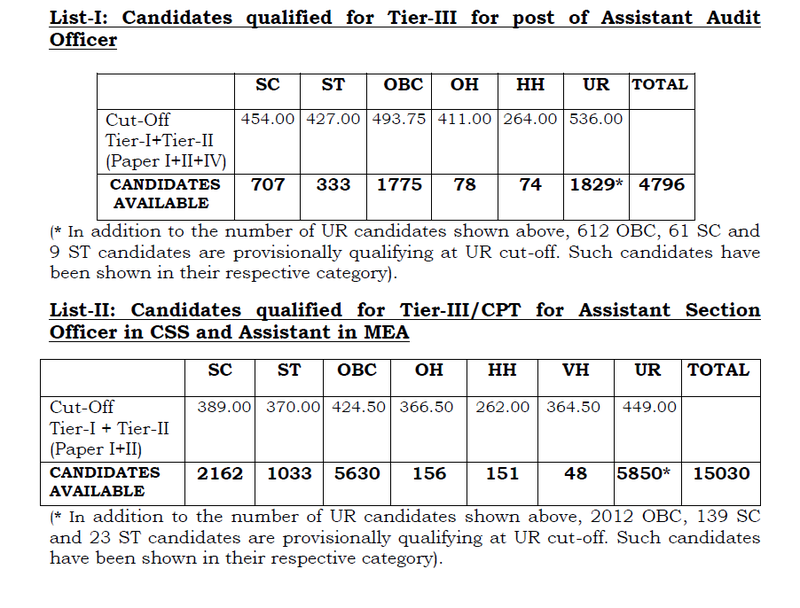 i) All the candidates declared qualified in Tier-II will be called for Tier-III/Document verification. ii) All candidates qualified in more than 1 List need to appear for Skill Test(DEST/CPT)/document verification only once. iii) Revised options can be submitted by the candidates during the document verification, if they so desire, which will be final. If options are not revised, the option submitted in the application form will be accepted as final. 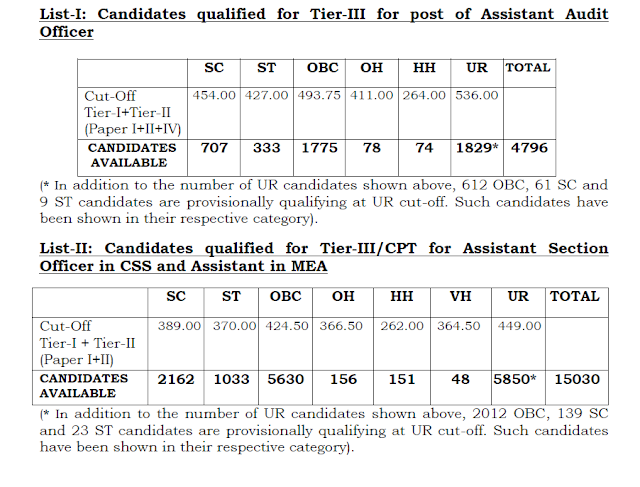 iv) Candidates declared qualified in List-II will be called for CPT. The candidates called for CPT will not be called for DEST separately and Module-I of CPT will be taken for evaluating their performance against DEST. 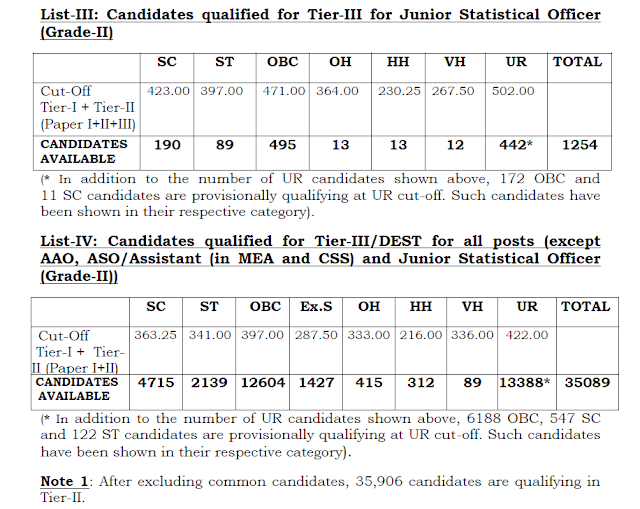 v) Candidates declared qualified in List-IV will be called for DEST. List-I - To appear in Tier-III/Tier-IV/Document Verification. List-II- To appear in Tier-III/Tier-IV/Document Verification/CPT. List-III- To appear in Tier-III/Tier-IV/Document Verification. List-IV- To appear in Tier-III/Tier-IV/Document Verification/DEST. 6. The lists herein are provisional. The candidates whose Roll numbers figure in the lists would be called for document verification subject to their fulfilling all the eligibility conditions/requirements as prescribed for the respective posts in the ‘Notice’ of Examination and also subject to thorough verification of their identity with reference to their photographs, signatures, handwritings, preference, etc., on the application forms, admission certificates, etc. If, on verification, it is found that any candidate does not fulfill any of the eligibility conditions, he/she will not be allowed to attend the document verification. 7. The category of the candidates has been indicated along with their roll numbers. If any candidate finds a mismatch between his/her name, roll number and category, he/she must bring it to the notice of the respective Regional Office of the Commission immediately. 8. The schedule for Tier-III/Tier-IV/Document Verification/CPT/DEST will be available on concerned Regional Office’s website. Qualified eligible candidates, who do not receive call letters should contact the concerned Regional Offices of the Commission immediately. 9. Representations received from the candidates about the answer keys have been carefully examined and the answer keys have been modified wherever necessary. The modified answer keys have been used for evaluation. 10. The result is available on SSC's Website: http://ssc.nic.in. Marks of the candidates will be placed on the website shortly.